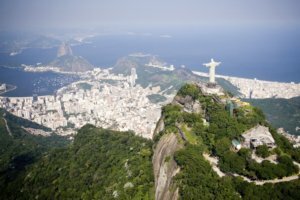 The famous Rio de Janeiro Christ the Redeemer statue is the face of this amazing city. This breath taking masterpiece overlooking Rio has been admired and visited by millions of people since it was first built in 1931. The Rio de Janeiro Christ the Redeemer statue is one of the most significant land marks around the world. Amazing Fact #1 - Whose Idea Was It? - The idea behind the statue was first proposed in the mid 1850's when a Catholic Priest by the name of Pedro Maria Boss requested the finance to build a religious monument in the city. However, the idea was dismissed and the monument was never built. In 1921 a monument was proposed again by the Catholic Circle of Rio. They appealed to the public for support and donations to have something built to represent the religious strength in the country. Amazing Fact #2 - What Does Christ Stand For? 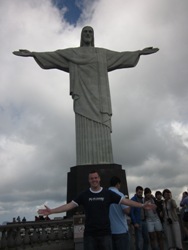 - Christ the Redeemer statue (or Christo Redentor as it's known in Portuguese) is a worldwide symbol for peace. This amazing statue took nine years to complete, and is made from reinforced concrete with the outer layers being soapstone. These materials were chosen for the Rio de Janeiro statue due to their hard wearing qualities and ease to work with. Amazing Fact #3 - Who Designed Cristo Redentor? - The overall design of the statue was created by a local designer; however, a French sculptor was commissioned to sculpt the Christ the Redeemer. The overall cost of the statue was the equivalent of $250,000 today. In 1980 Pope John Paul II was scheduled to visit the Rio de Janeiro statue and major restoration work was undertaken. In 2003 escalators and elevators were built, to allow people to gain easier access to the viewing platform. Amazing Fact #4 - Has It Ever Been Struck By Lightning? - In 2008 forceful lightning struck the monument causing damage to the fingers, eyebrows and head. Work was undertaken to restore these points on the statue, and some of the soapstone was removed and replaced. The lightning rods also needed to be repaired due to the extent of the damage. The focus of the last restoration in 2010 was to maintain the interior of Cristo Redentor. All of the stone that was used in the restoration was taken from the quarry that the original pieces were from. A fantastic lighting system was also installed to light up the base of the monument. Amazing Fact #5 - Who Would Vandalize Christ? - In 2010 an act of mindless vandalism occurred when someone spray painted the Rio de Janeiro Christ the Redeemer statue. The mayor declared it a crime against the nation, and a reward was put forward to catch the culprit. Cristo Redentor proudly took its place in the list of seven new wonders of the world in 2007, and has been used in many films and documentaries over the years. At 38 meters tall and weighing 1.145 tonnes there is no doubt that this staggering monument is one of the most amazing manmade structures in the world.